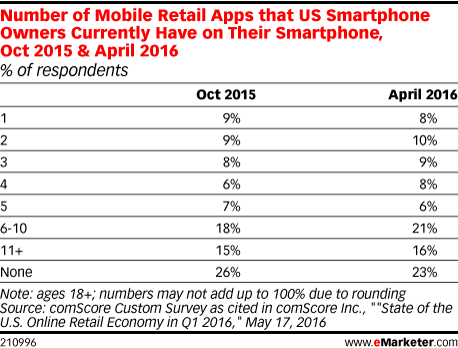 Consumers are steadily downloading more retail apps to their device compared to a year prior, research found. Indeed, nearly a quarter of respondents said they have between six and 10 retail apps on their smartphone as of April 2016, up 3 percentage points from October 2015. David Rush, CEO and co-founder of real-time social media marketing platform Earshot, discusses how shopper marketers can effectively communicate with and convert the multichannel shopper. Morgan McAlenney, executive vice president of Digitail at shopper marketing agency The Integer Group, talks about what makes shoppers change their habits and what that means for brands. Retail marketers in the US will invest $15.09 billion in paid digital media advertising in 2016, a 14.9% rise over 2015. The retail industry will remain by far the largest digital ad spender among US industry sectors tracked by eMarketer through at least 2020. Department stores offer several digital services to consumers, ranging from personalized promotional offers to receiving recommendations from a personal shopper. While some find these services to be cool, others find them creepy. As mobile usage becomes ubiquitous, the path to purchase is becoming less defined. Shoppers are always connected, well-informed and often quick to convert both digitally and in-store. The traditional shopping phases still exist, but once smartphones are introduced, behavior shifts. Promotions in weekly circulars can drive purchases at grocery stores, according to February 2016 research. In fact, more than a third of grocery buyers shop at a store frequently because of these offers. Walgreens is measuring the impact of customers' smartphones on in-store purchases. Kartik Subramanian, Walgreens' director of product management and mobile commerce, explains. Jeff Campbell, co-founder and managing director of Resolution Media, talks about the ways mobile can influence consumers as they move through the path to purchase and why retailers should rethink the way they measure mobile advertising. Migrating analog processes and data to digital technologies has become increasingly valuable for retailers and manufacturers that want to more closely monitor their supply chain. 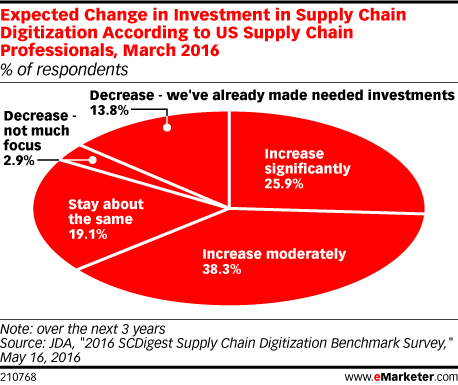 According to research, well over half of these firms expect to step up dollars for supply chain digitization. Ryan Freeman, vice president of partnerships at proximity marketing platform Turnstyle Solutions, offers advice on how retailers can better cater to their customers. Executives at Opera Mediaworks and Unacast discuss using beacon and proximity data for retargeting. Bryan Galipeau, director of social media and display at retailer Nordstrom, spoke to Maria Minsker about what makes Snapchat powerful. Mother’s Day spending in the US is expected to reach $21.39 billion this year, a slight increase compared to a year prior, according to research. Marissa Tarleton, CMO for North America at digital coupon marketplace RetailMeNot, discusses how retailers should cater to mobile shoppers with personalization and relevancy. More than eight in 10 Gen Z and millennial internet users in the US feel it’s important for a brand to operate a brick-and-mortar location. And other, older generations are not too far behind, according to findings.